When your pup needs to go, you can depend on Earth Rated poop bags to cleanly, safely, and effectively dispose of dog poop. Earth Rated scented dog waste bags are the best-smelling dog waste products on the market today. Featuring a refreshing lavender scent, our dog waste disposal bags are made to fit into most standard-sized leash dispensers. We have designed our dog waste bags bigger (9” x 13”), tougher, thicker and completely leak-proof! These bags are easy to open and detach from the roll without compromising on thickness or toughness. Earth Rated products are the industry leader in terms of quality and – more importantly – affordability. We focus on the smallest details - even our packaging and dog poop roll cores are made from recycled materials. We also have exceptionally high-quality manufacturing standards: Our multiple warehouse locations reduce the travel distance required to ship products, which not only expedites the shipping process to you – but also cuts down on emissions due to reduced travel. We take pride in our precision manufacturing standards. In fact, if our bags don’t make the cut for our customers, they are donated to local dog shelters. This refill pack includes 18 rolls of 15 lavender-scented bags that can be used on their own or with our cute green-colored dispenser. The team at Earth Rated has an unprecedented passion for pets, our customers, and our products. It has always been our priority to offer a quality product with a modern design at affordable pricing accompanied by top-notch customer service. High-quality dog waste bags: These bags measure 9" x 13" and are bigger, thicker and tougher than all other poop bags. Lavender-scented: Included are 18 rolls of 15 lavender-scented bags that fit into most dispensers. Easy to open and detach from the roll: Our bags are easy to open and detach from the roll while still being extra tough. 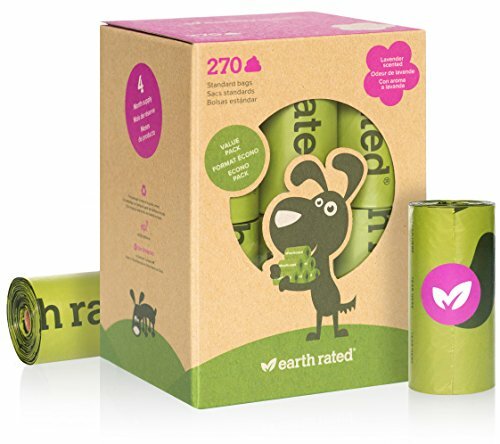 Environmentally conscious: Our poop bag roll cores and packaging are made from recycled materials. If you have any questions about this product by Earth Rated, contact us by completing and submitting the form below. If you are looking for a specif part number, please include it with your message.